Liliane Tomasko's paintings are veiled in darkness--evocative and emotionally charged. Over the last decade the underlying drawings beneath the layers of thick paint have evolved into her "inside out" paintings. 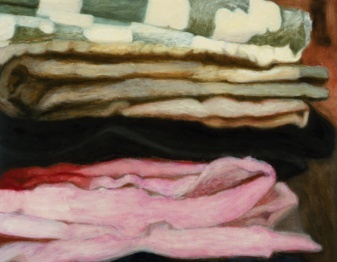 A reversal of process, the colorful textiles are strewn, stacked and composed--undulating and transforming from abstraction to mountain vistas. From darkness into light, the viewer is transported to another time and space within these intimate, quiet and edgy interior settings. Curated by by Virginia Shore.